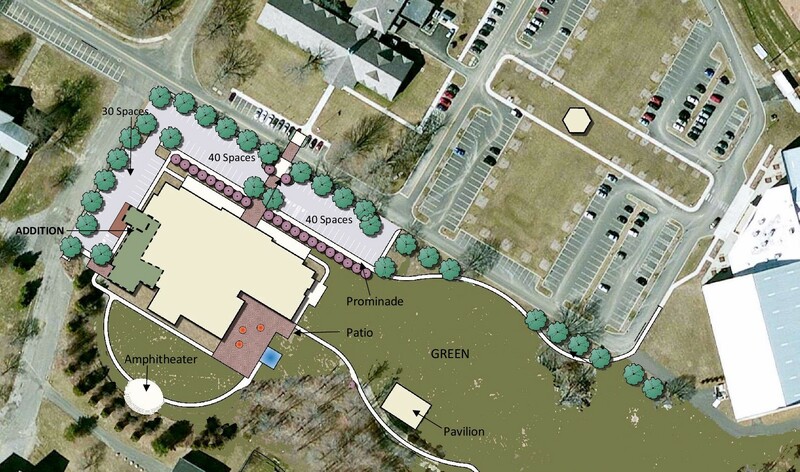 This elevation graphic shows the planned site of the new community and senior centers, which will be located on the site of the former Canaan House at Fairfield Hills. During its regular meeting May 15, the Board of Selectmen unanimously authorized retaining AAIS Corp, the same contractor that handled the initial phases of the Canaan demolition, to complete foundation demolition and removal of the former state hospital building. The team rolling in to complete demolition of the Canaan House site at Fairfield Hills ahead of groundbreaking for the new community and senior center facility is acutely qualified and intimately familiar with what needs to be done. During its regular meeting May 15, the Board of Selectmen unanimously authorized retaining AAIS Corp, the same contractor that handled the initial phases of the Canaan demolition. AAIS of West Haven was chosen for the project, in part because the company is a certified demolition contractor under state contract agreements. Officials, including Public Building & Site Commission (PBSC) Chairman Robert Mitchell also believe - because AAIS workers know exactly what they need to do, and where to do it - the company will be able to expedite and economize this final site prep work before the community/senior center project can commence. On a related subject, selectmen also unanimously appointed two groups of residents who are also intimately familiar with, and helped guide, the community center and senior center development processes up to this point. The new ad hoc Community Center Advisory Committee will include Bill Buchler, Andy Clure, Maureen Crick-Owen, Brian Hartgraves, Nicole Hockley, Carla Kron, Brian Leidlein, Kinga Walsh, David Wheeler, and Parks and Recreation Director Amy Mangold. The new Senior Center Advisory Committee will be Barbara Bloom, John Boccuzzi, LeReine Frampton, George Guidera, and Anna Wiedemann. All members of the senior center panel are current or former members of the town's Commission on Aging, and all members of the community center group previously served on a center advisory committee. Documentation circulated to selectmen for review before their vote on the committees identified the roles of various players involved in the preconstruction process from programming and schematic design to bidding, scheduling, budgeting, and reporting to construction and closeout. The advisory committees are envisioned to play a role throughout the process beginning with providing input to the design team's work, and helping to align the project to the overall scope and cost parameters related to the aquatics, program space, and potential programming uses, along with input on space-specific needs and design features in coordination with Parks and Recreation personnel and others. During the bidding process, advisers will also be tasked with helping establish priorities, as requested, regarding value management and engineering. During the next phase, committee members will be expected to provide periodic reports to the community regarding the project's schedule and general status, as well as benchmarking certain events like the groundbreaking and ribbon cutting activities as the finished center is ready to open. In the final stages of project closeout, advisers will also be responsible for developing and executing a marketing campaign for the facility's launch, and in conjunction with other agencies like Parks and Recreation, provide input on management and operations including ideas about staffing levels, staff roles, responsibilities, and general structure for the facility's oversight and supervision. During furniture, fixture, and equipment (FFE) and technology procurement, and contingent upon funding, members of the committees will then work with design team members from Quisenberry Arcari to seek input and compile a list of recommended furniture and equipment for the facility; develop a project budget for furnishings and equipment in coordination with town IT and other department representatives; and consult on any alternate items that might be required to furnish and equip the centers, as well as coordinating delivery and installation. Turning to the final stages of site development, PBSC Chairman Mitchell presented a document supporting the retaining of AAIS. "We are recommending that the demolition contractor who performed that previous demolition be retained by the town to complete the subsurface demotion and removals, rather than develop a new invitation to bid through the public bidding process," the memo stated. "This process will save 60 to 90 days in the project timeline." The memo goes on to state that AAIS was selected through the standard town process - three firms from the state list were requested to submit bids on the project. Companies were interviewed and the selection of AAIS was made based on a high level of confidence that the project would be completed with all conditions related to timing, expertise, and cost. "AAIS performed very well and we see no reason to go through the entire process over again," the memo concludes. The PBSC opinion was echoed by Deputy Director of Community and Economic Development Christal Preszler, who told selectmen that she did not think a project could have gone better. "AAIS did more than they said, were always available, any variations were all vetted," she said adding that their process was well set and the company was conscientious. Ms Preszler said AAIS crews even started their initial phase of demolition work in back of Canaan House to minimize the spectacle to passersby, and worked around events on campus to minimize visitors' exposure to noise and construction-related dust or debris. Fairfield Hills Authority Chairman Ross Carley told selectmen that he appreciated the AAIS workers doing material grinding onsite. "I was very impressed," he said, "there weren't a lot of trucks coming and going. And they were very careful about rescuing features at their own expense." He described the relationship between the contractors and town officials as "refreshing behavior." Mr Mitchell rejected the idea of the time-consuming process of going out to bid and endorsed AAIS as "the only firm that knows what is underground." "They know intimate particulars of what is left to demo," Mr Mitchell said. "By going this way it will save three to four months versus putting the project out to bid. They understand the site, and I anticipate a good number," he added, referring to the pending AAIS contract cost parameters. Finance Director Robert Tait concurred, saying, "It makes a lot of sense to use the same company."